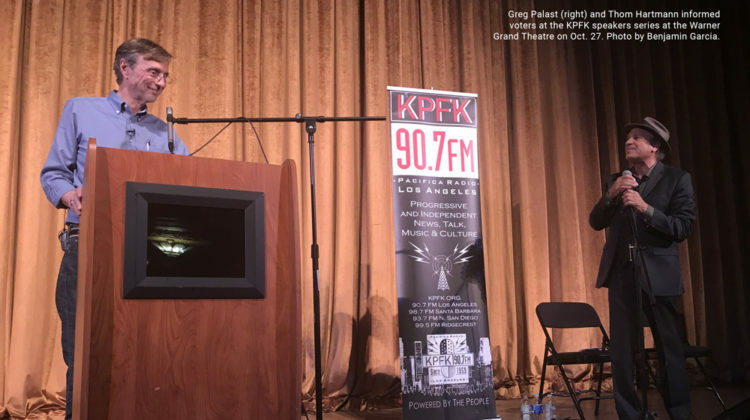 Six hours after the deadliest shooting at a synagogue in American history, nationally syndicated talk show host Thom Hartmann entered San Pedro’s Warner Grand Theatre to speak to a crowd of more than 800 about voter suppression and gun control in the United States. The Oct. 27 shooting followed a week of interceptions of explosive devices mailed to prominent Democrats and critics of the Trump administration. The message delivered by this town hall is that the prescription for what ails this democracy was the same as before the shooting — vote in overwhelming numbers. Random Lengths News caught up with Hartmann to discuss America’s political landscape before the talk. The prevailing topics were voter suppression and immigration. Voter suppression is a huge problem across the country, specifically in low-income areas. CNN reported that since 2016, nine states, or nearly one-fourth with Republican state legislatures, have restricted voting in some way. Journalist Greg Palast added his voice to the discussion. Also, his documentary, The Best Democracy Money Can Buy, in which the prolific writer explains that more than 7 million voters — almost entirely people of color — were on the Crosscheck list (the so-called anti-vote fraud program) by the 2016 presidential election. It was alleged that these voters voted multiple times in past elections. But none were prosecuted for voting twice, which is a felony. Hartmann noted that 14 million voters have been pulled off the voting rolls in the last year. Nearly 139 million people voted in the 2016 national election, according to the United States Elections Project — an all-time record. But that turnout was only 60 percent of the country’s 232 million eligible voters. Hartmann posited that if Democrats win the midterm elections, it won’t be because they turned out to vote 51 to 49 percent, but because whatever the actual recorded margins are, the Democrats turned out five to 10 percent more than that. “If we lose it will be because voter suppression still works,” Hartmann said. Voting counts. It’s a numbers game. Hartmann argued the Supreme Court has ruled in Bush v. Gore that there is no right to vote. Voting, Hartmann argues, is a privilege granted by the state. “You would think the vote would be at the center of everything,” Hartmann said. “Unfortunately, the Supreme Court has chosen not to see it that way. Hartmann noted that not since the founding of the Republic has voter suppression been so explicit. As voter suppression has become a stain on our democracy, Hartmann believes there is a major issue for progressives that will only get worse if not faced. Democrats must come together with a detailed and coherent position on immigration. This issue is basically “race and culture in code” for the Republicans, Hartmann added. For the Democrats, there’s not that much concern about race or changing culture, whereas Republicans would say that’s a sign of not being an “American,” defining American as white Anglo-Saxon. That’s why the progressives and Democratic party have to come up with a coherent solution. For Hartmann, that coherent solution is a return to an earlier Democratic position that would limit immigration in order to preserve the labor market in the United States. The best example of that is the construction trades industry or the meatpacking industry. Both industries used to be heavily unionized and paid really good wages. Hartmann asserted these trades have been turned into low-wage industries largely because they have embraced non-citizen labor. “As long as there is truth to that, the Democrats are going to have a problem,” Hartmann said. Hartmann noted that this is why we have much of America voting for Republicans. He explained that working-class whites are voting for Republicans willing to support and provide political cover for Trump’s immigration raids. But it’s a situation of bait and switch. This was largely part of Reagan’s efforts to destroy the unions — to not enforce the labor laws with regard to citizenship, Hartmann said. Hartmann agreed with former Republican presidential candidate Mitt Romney, who had a different position. Romney said if we started putting employers in jail who hire people who are not here with documentation, then they would stop employing people and a lot of people would simply go back home. This would then provide a timetable to reasonably integrate people that we have here. Hartmann said he does not know of a single Democrat who wants open borders. It’s “a canard, a straw man.” But it’s one that the Republicans are using very successfully against the Democrats right now. He often gets calls from African Americans on his show who are very concerned about the Democrats not taking a strong position on illegal immigration. These issues can seem insurmountable. But turning toward recent evolution on the left, Hartmann discussed the Democratic Party’s so-called divide and its adoption of progressive/socialist voters and candidates. Since the Democratic Party is a “billion-dollar machine,” his hope is for enough people to get together to seize control of the party. With that, you get the leverage of a national movement. Yet, Hartmann said, right now there may only be “a few [to] 10,000 (Democratic Socialists).” It’s not enough money or offices or people to really do that much. Finally, Hartmann has hope about the number of women running for political office. Melina Paris is a Southern California-based writer, who blends her passion for writing and connecting people to their local community into pieces centered music, cultural events, the arts, and most recently, the intersection of art and social justice.